We, the presidents of the undersigned cultural organizations, call on the international community to protect the ancient sites and antiquities of Libya, which face very real threats of damage and destruction caused by the civil unrest and military action currently taking place there. The cultural heritage and archaeological resources located in Libya are irreplaceable elements of the world’s shared memory, going back thousands of years. The importance of guarding these treasures while civil unrest is underway cannot be overestimated. We strongly urge immediate action to protect Libyan antiquities, cultural heritage, and archaeological sites, as illustrated at http://archaeological.org/news/aianews/4604. Through such action, significant archaeological artifacts and irreplaceable historic objects will be preserved in situ and in the many Museums and sites across the country. Such an initiative will also help stem illicit international crime organizations that have links to money laundering, human trafficking and the drug trade and are known to exploit civil unrest and political instability for profiteering. The Department of State to work with the U.S. Customs and Border Protection Agency in implementing import restrictions on undocumented cultural artifacts from Libya. The Federal Bureau of Investigation and ICE to coordinate with foreign counterparts and intensify their antiquities enforcement operations, with a view to initiating targeted law enforcement operations with the aim of the seizure of the stolen or illegally exported cultural property, the arrest of the criminals involved, and the seizure of the proceeds of these and related crimes. 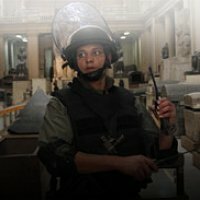 US-AID to grant additional monies for protection and management of archaeological sites, museums, and historical monuments. INTERPOL to use its special expertise in identifying and sharing critical information throughout its 188 member countries, and in particular to use its I- 24/7 telecommunications system for the exchange of information related to crimes involving Libyan cultural property and to identify suspicious financial transactions which can lead to the freezing and confiscation of the proceeds. The United States Congress to designate funds for the protection of Libyan antiquities as part of its economic aid package for Libya. The European Union to designate funds for the protection of Libyan antiquities as part of its economic aid package for Libya. The People Republic of China to designate funds for the protection of Libyan antiquities as part of its economic aid package for Libya. These actions are in keeping with U.S. international obligations under the 1970 UNESCO Convention on the Means of Prohibiting and Preventing the Illicit Import, Export and Transfer of Ownership of Cultural Goods. They will help promote the protection of invaluable cultural artifacts. They will continue to provide the crucial basis for tourism revenue as Libya seeks to build a successful democratic economy.